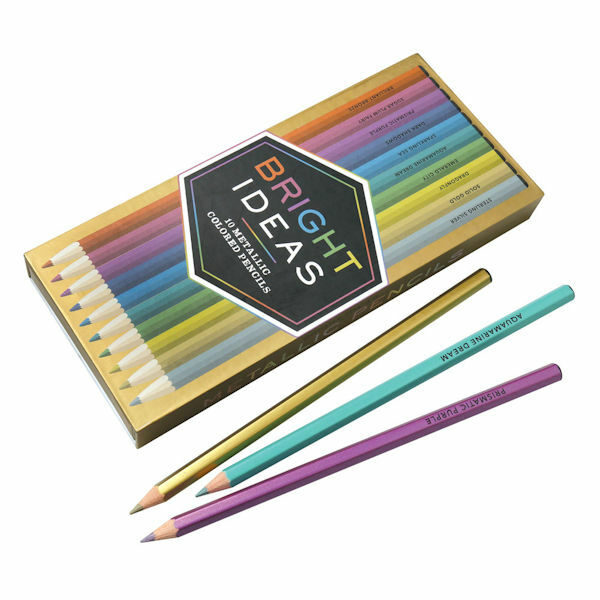 Brighten your coloring book, your sketch pad, and your day with our Bright Ideas Colored Pencils. Each set contains ten pencils, packaged together in a nice slide-close storage box and stamped with oh-so-creative color names. Stay Classic with shades of "fresh squeezed scribbles" and "painting the town red," add elegant shimmer with Metallic hues like "brilliant bronze" and "sparkling sea," or amp up the Neon color with "hot hot pink" and "day-glo green." Can't choose? Get a box of each! ROYGBIV never looked so good.